Regin S220 Smoke Pen. FREE SHIPPING! Find air leaks around windows, doors, and ductwork. The Regin S220 Smoke Pen produces cool, dense smoke--perfect for finding air leaks around windows, doors, chimneys, exhaust hoods and laboratory equipment. Ideal for air balancing, verifying ventilation systems, and verifying negative or positive air pressure. A handy tool for K9 scent detection training. Also great for testing smoke alarms. The smoke stream is dense and white, reacting readily to small drafts and light air movement. The smoke has great hang time, letting you watch air flow patterns over long distances. The S220 Smoke Pen contains a patented smoke-emitting wick that is lit with a cigarette lighter or match. The glowing tip emits smoke for as long as you need. A single wick will emit smoke for up to half hour, but can be start and stopped by capping and relighting as needed. There is no waste; no mess—only safe non-toxic smoke. The unused portion of the wick stores safely in the barrel of the pen. This reusable product comes with six wicks, providing a total of three hours of continuous smoke or about 360 individual 30-second tests. The S220 Smoke Pen has a long shelf life when stored in a cool dry location. FREE GROUND SHIPPING for US customers! 1. Remove the soft black cap from the end of the pen. 2. Place the wick in the pen by pressing the chrome button on the end of the pen to open the jaws. 3. Adjust to allow approximately 3/8” of exposed wick. 4. Light the tip of the wick and allow it to burn for 10-15 seconds, blow out the flame. The pen will provide a stable and continuous stream of smoke. 5. Extinguish the wick by replacing the soft plastic cap over the wick end of the pen. 6. To re-use, simply adjust the length of the wick and follow the steps as described above. 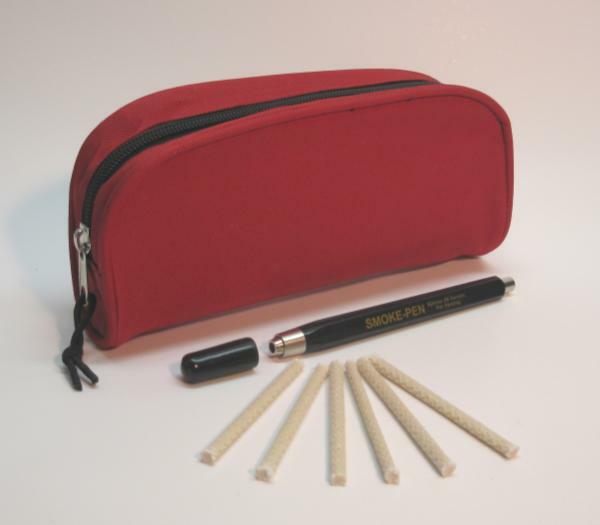 This professional, heavy-duty nylon zippered carry case is the perfect size for holding a Regin Pen or two, a couple packs of wicks, the instruction sheet, and your lighter or matches. The carry case tucks away conveniently in your tool box. Supplied in one of three random colors: Red, Navy or Grey. Note your color preference at check out and we'll try our best to ship it. I've used the Regin Smoke pen to find air leaks around my window sashes, sliding doors, door jams, electrical outlets and switch plates. The thin stream of dense white smoke reacts to the smallest air movement. The smoke lets you see right where cold air is leaking in so you can effectively plug the drafts with a little caulk, spray foam or weather stripping. I light the S220 wick off my electric stove burner. There's virtually no odor(nothing even remotely like cigarette smoke or incense sticks) and there's no ash residue. The mfr says the smoke is non-toxic- safe- tho I wouldn't want to breath it directly in. The Regin smoke pen is just as its name describes. It is about the length and diameter of a typical writing pen with a smoke-producing wick coming out the tip, much like a mechanical pencil. It stores away nicely in your junk drawer or tool box. Remember, the smoke is created by a burning wick, so be careful where you set the lit pen down and of course, keep the S220 away from any flammable fumes like gasoline, natural gas or propane. The Regin smoke pen comes with 6 wicks. Each wick will burn for about 30 minutes, so you get around 3 hours of test time with your original purchase. The smoking wick can be snuffed by replacing the pen cap, and the remaining wick saved until your next air leak test. Extra wicks are available in a six-pack, S221. Today, a customer was describing how he uses his S220 Smoke Pen when scent-training K-9 dogs. He uses the smoke to verify direction and speed of air flow over the places where they hide the scent bags. He says the thin trail of white smoke is very sensitive to even the slightest air movement which helps him identify scent trails in calm conditions. 1/12/2010 – How big is the smoke particle? Thanks.